Pseudohypoaldosteronism (PHA) comprises a heterogeneous group of disorders of electrolyte metabolism characterized by an apparent state of renal tubular unresponsiveness or resistance to the action of aldosterone. It is manifested by hyperkalemia, metabolic acidosis, and a normal glomerular filtration rate (GFR). Volume depletion or hypervolemia; renal salt wasting or retention; hypotension or hypertension; and elevated, normal, or low levels of renin and aldosterone may be observed in the various conditions that result in this syndrome. Pseudohypoaldosteronism (PHA) is subclassified into PHA type I (PHA1), which is the classic form, and PHA type II (PHA2), which is is a genetically heterogenous group of disorders also referred to as Gordon syndrome or chloride shunt syndrome. PHA1 itself has been recognized as a heterogeneous syndrome that includes at least 2 clinically distinguishable entities (PHA1A and PHA1B) with either renal or multiple target organ defects. Early childhood hyperkalemia, or renal tubular acidosis type IV subtype 5, is a variant of the renal form of PHA1. PHA1A is caused by mutations in the NR3C2 and shows autosomal dominant inheritance. Loss-of-function mutations in the NR3C2 gene are common. PHA1A is characterized by salt wasting resulting from renal unresponsiveness to mineralocorticoids. Patients may present with neonatal renal salt wasting with hyperkalaemic acidosis despite high aldosterone levels. These patients improve with age and usually become asymptomatic without treatment. Some adult patients with the disorder may have elevated aldosterone levels, but no history of clinical disease. PHA1B is similar to PHA1A, but more severe systemic disorder with persistence into adulthood. PHA1B can be caused by mutation in any one of three different genes encoding the epithelial sodium channel (SCNN1A, SCNN1B, or SCNN1G), and is autosomal recessively inherited. There is a high incidence of consanguinity among parents, and the degree of penetrance varies. Most studied kindreds have had a loss-of-function mutations in any one of the three afrementioned genes. Sporadic cases of PHA1B have also been suggested, and these have been postulated to arise from polymorphisms that alone do not result in negative salt balance but together may interact negatively. The disorder is characterized by high concentrations of sodium in sweat, stool, and saliva. PHA2A, also known as Gordon hyperkalemia-hypertension syndrome, is an autosomal dominant disorder characterized by hyperkalemia despite normal renal glomerular filtration, hypertension. The disorder is sensitive to the treatment with thiazide diuretics. PHA2A is caused by mutation in an as yet unknown gene, which is curently mapped on 1q31-q42. PHA2B and PHA2C are caused by heterozygous mutation in the WNK4 and WNK1 gene respectively and are autosomal dominantly inherited. Mutations in the WNK4 and WNK1 genes lead to increased NaCl reabsorption and decreased potassium secretion. Patients under the age of 20 generally have normal blood pressure and develop hypertension only in adulthood. Hyperkalemia, mild hyperchloremic acidosis and low renin are present from a young age and are constant findings. Growth failure has been described in some cases. 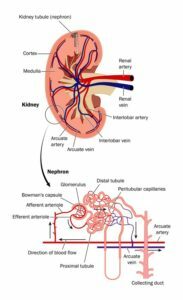 Kidney function remains normal. Spitzer-Weinstein syndrome (also konwn as adolescent hyperkalemic syndrome) is an early presentation of PHA2 with hypertension and may be associated with short stature, muscle weakness, and periodic paralysis. PHA2D is caused by mutations in the KLHL3 gene and may be either autosomal dominant or autosomal recessive. The phenotype of patients carrying either type of mutation is similar. The disorder is characterized by renal hyperkalemia and otherwise normal renal function, hypertension, and acidosis. The mean age at diagnosis or referral among patients is reportedly around 24-26 years of age. PHA2E is caused by mutations in the CUL3 gene, it is autosomal dominant and is by far the most sever form of pseudohypoaldosteronism type 2. The disorder is characterized by renal hyperkalemia and otherwise normal renal function, hypertension, and acidosis. The onset is typically in childhood, with a mean age at diagnosis or referral at around 9 +/- 6 years of age. Hypertension is present in almost all patients at or before 18 years of age. As described above, genetic pseudohypoaldosteronism can be caused by monoallelic or biallelic mutations in one of several different genes. The genes recognized so far are CUL3, KLHL3, NR3C2, SCNN1A, SCNN1B, SCNN1G, WNK1, and WNK4. Mutations in at least one more gene (which is yet unknown) cause PHA2A. Loss of functions mutations are common. Posted in Academia, Disease cards, Last Update, Medical Genetics and tagged CUL3, KLHL3, NR3C2, Pseudohypoaldosteronism, SCNN1A, SCNN1B, SCNN1G, WNK1, WNK4.